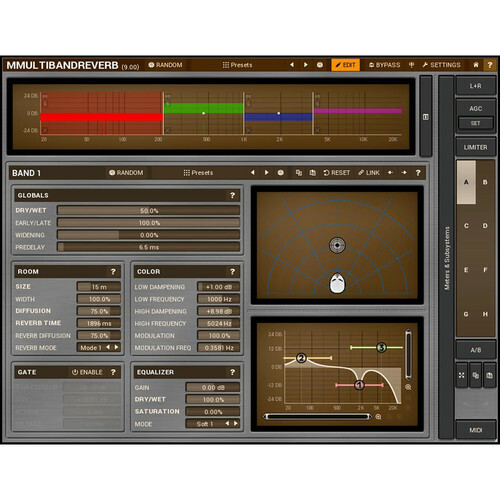 The MMultiBandReverb from MeldaProduction is a fully algorithmic, true-stereo reverb plug-in with a spatial positioning system that automatically adjust parameters to reflect the graphically chosen position of the sound source in the sound field. The software can generate everything from extremely realistic halls to unworldly effects, aided by an integrated parametric equalizer, 6 bands, gate, 4 modulators and a smart randomizer. Extensive modulation is possible using multiple modulation sources, with each modulator being able to work as an LFO, audio level follower, envelope generator, randomize, or pitch detector. Since things could get a little confusing for beginners, the dual interface makes it easy to start processing by providing a few knobs and dozens of useful presets, with the ability to switch to edit mode for access to deeper functions.